Beginning in April, GSCCC will hold Town Hall meetings. These meetings provide opportunity for volunteers to connect with Council staff, other volunteers in the community, and a space to share your thoughts and ideas. All volunteers are invited to attend the Town Hall meeting that is closest to you. Click here to RSVP and for your opportunity to provide input to the agenda. Take a Girl Scout to Work Day - Spring Break! Girl Scouts of the Colonial Coast is hosting several opportunities for Senior and Ambassador Girl Scouts to visit with local professional women to learn about their occupation. Each mentoring experience will take place in the morning and be done prior to lunch. Specific details will be coordinated once the girls have been selected to participate. Each high school girl selected for this program will be representing our Council and is expected to be in full Girl Scout dress uniform, white shirt with a khaki skirt or pants and their current vest or sash. We expect each event to be covered by our marketing team and, in some instance, by the marketing team at the business. Therefore, girls must have written permission to attend and a current media release. It’s almost that time of year again—time for you and your girls to renew your Girl Scout memberships for another year of exciting opportunities! We all know the Girl Scouts offers girls a lot more than just a fun place to hang out and make new friends. With Girl Scouts, girls have the chance to build courage, confidence, and character as they become go-getters, innovators, risk-takers, and leaders. But first, they have to renew their membership! 1. Girls have a chance to earn free patches. Girls can earn a free early renewal patch PLUS, they can earn a free, exclusive First Day patch by registering by April 2, 2018. 2. You'll get special deals to our GSCCC retail shops. 3. There's no way around it, renewing is just way more convenient. The fall can get a little busy with back to school business, but when you renew your Girl Scout membership early, that’s one less thing to worry about when August comes around. You can renew beginning April 1. Need help? Contact our Customer Care team at customercare@gsccc.org. Our friends at Old Dominion University are hosting the founder of Black Girls Code, Kimberly Bryant, to speak on March 29 about the "Rising Tide of Diversity in Tech". Her non-profit organization is dedicated to introducing girls of color to the fields of technology and computer science with a concentration on entrepreneurial concepts. Seating is limited. Guests are encouraged to register at odu.imodules.com/KBL18. Attend this training and be able to take your girls camping in a cabin or other walled structure. Learn to cook using charcoal and on propane stoves. Register on eBiz by April 22. Do you have at least one girl in your troop who will be bridging to the next Girl Scout level? If so, learn about the bridging steps as well as the awards the girls can earn by viewing this webinar recording. Complete this survey after you have viewed the Girl Scout Bridging Webinar recording. We all know ther Girl Scouts offers girls a lot more than just a fun place to hang out and make new friends. With Girl Scouts, girls have the chance to build courage, confidence, and character as they become go-getters, innovators, risk-takers, and leaders. But first, they have to renew their membership! Friday, March 23 6 p.m.- Saturday, March 24 10 a.m.
Come join the sisters of Kappa Delta for a fun night of games, songs, and movies! Bring your sleeping bags, your wilderness skills, and an empty stomach to fill with campfire treats. This is a girl only event. Free to Girl Scouts only, no tagalongs. Spring is Coming! Your Outdoor Adventures Await! Spring will be here soon and we’ve got great opportunities for you to get outside and get your adventure on! Spend your afternoon playing in the trees with your troop or favorite adult. Go behind the scenes to learn how STEM plays a role in this outdoor playground. Visit the GSCCC Events page for more details. Girl Scout Cadettes only. Girls have the option to register for one or both workshops. Registration is now open for the Kempsville Entrepreneurship and Business Academy Workshops. The Academy faculty and students will be leading two workshops: Entrepreneur and Comparison Shopping. Girl Scout Cadettes will learn how to think like an entrepreneur and learn how to go online to find the best deals on the best products in the safest way possible. This Academy-Girl Scout partnership is the Silver Award project of Sydney Brown, Troop 571. Click here for more details and to register by April 10 (or until full). For parents of children with special needs and health challenges. Do you have at least one girl in your troop who will be bridging to the next Girl Scout level? If so, you will want to join us for this webinar on Girl Scout bridging. Learn about the bridging steps as well as the awards the girls can earn. 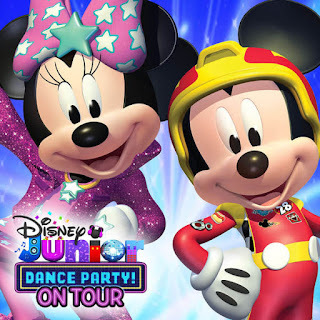 Disney Junior Dance Party! On Tour presented by Pull-Ups® Training Pants is coming to Norfolk! This ALL NEW interactive live concert experience features a singalong to Disney Junior’s greatest hits with your favorite characters: Mickey and the Roadster Racers, Sofia The First, Puppy Dog Pals, Elena of Avalor, Doc McStuffins, Vampirina, The Lion Guard and more! Kids of all ages and their families are invited to get up and dance, play games and join the biggest dance party around on April 14, 2018, at 4 p.m. at the Ted Constant Convocation Center! Tickets are priced at $23, $36, $46, and $66, and can be purchased at YnotTix.com, the Constant Center Box Office or by calling 877-YNOTTIX. Groups of 10 or more can receive $5 off certain tickets by calling 877-683-7087.